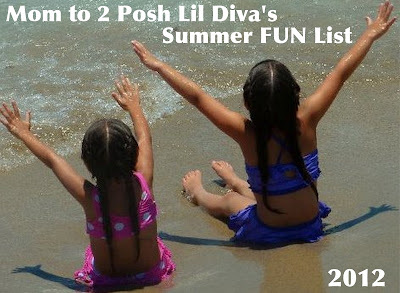 Google+ Mom to 2 Posh Lil Divas: Summer FUN (Bucket) List 2012! Summer FUN (Bucket) List 2012! This Mama will (hopefully!) be going back to work once the next school year starts up again so I feel like this final summer as a stay-at-home mom has to be extra FABULOUS! With my oldest in Kindergarten this past year and in school all day I felt like there were so many things that I wanted (and planned) to do but we just didn't get to. I am determined to cross as many of these things off our To Do List as possible this summer! 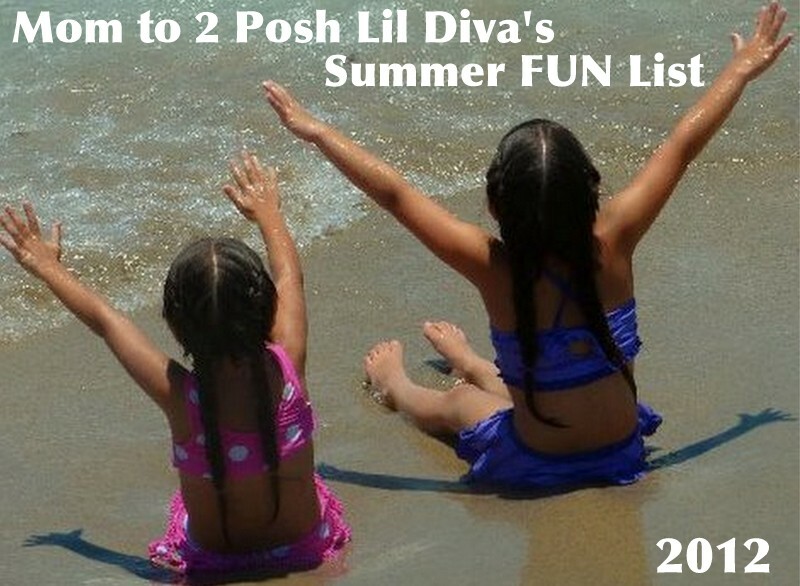 To help us focus a bit during our more laid back days of summer I decided to make a "Summer Fun List" with the help of my 2 fave girls. Why make a list like this? It was simply to give me a concrete visual that would help me keep track of all those "Fun Things We Have YET to Do & are going to do our best to cross off our list this summer. Do you want to know what's on our list? art & of course play ideas that will fill some of our summer days with Family Fun! & make personal photo albums of all the pics taken. 43. Have an Ice Cream Sundae Party! Most of these are just fun things for us to do together, mostly from home (I have a separate "Places to Go This Summer" List). A few of the activities will require me to have things ready ahead of time like the Crayola Model Magic, colored rice, washi tape, frozen paint (just leave a tray or 2 handy in the freezer) and the ice excavation (just drop in a few coins, toys, etc, into cups of water and let freeze) but most will be using supplies, recyclables or groceries we usually have on hand at home so that it will be easy to allow the girls to pick an activity and actually do it right then (or so I hope!). I plan to update this list with links as we complete the activities this summer - so be sure to check back if you would like to know more or see how an activity goes for us! I have LOTS more planned for the Lil Divas as part of our Summer Learning Fun so be sure to check back this week to see what else we will be up to this summer! Great ideas, Thank you for sharing. I hope you and your girls enjoy the summer holidays. I can't wait to see everything you do this summer. You always have such fun things planned!